Through an innocent Instagram post a few weeks back, it was brought to my attention that I've been using herbs since before it was 'trendy' to do so. Way before. Like more than 20 years ago! I was having health problems back then and someone gave me a copy of Today's Herbal Health and I read that book like my life depended on it! (I have the 3rd edition printed in 1992. The 6th edition is most recent issue and is available on Amazon) After curing my illness I started referencing that book for every little thing wrong with me. My love affair with herbal remedies had started! Back to the Instagram picture: that simple comment started me thinking....I've never really posted anything about using herbs because well, its so common and everyday to me that it doesn't feel like something special to tell you about. It was this weird feeling that "hey, I know something useful. Why am I hoarding that information?" Strange, right? I grow over a dozen different herbs every summer. I grow everything from Basil & Calendula to Lambs Ear and Valerian. I use them all too! I make oils and body butters, bath soaks and ointments, lip balms, teas, tinctures, creams and everything in between. Of course I cook with some too! So, today I decided to show you how I made an oil infusion using Calendula this summer. 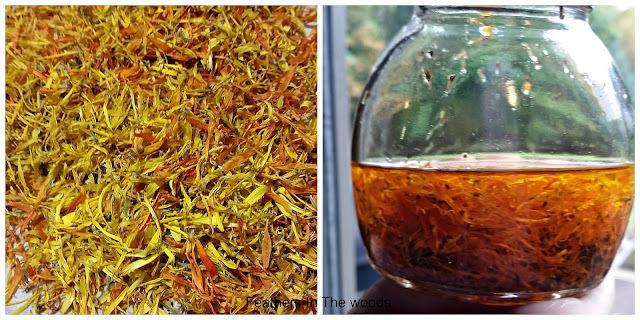 Calendula (Calendula officinalis) is excellent for healing the skin, which is why I chose to make this oil at the end of summer. I need it for dry chapped skin in winter! A few months back I had been given an Amazon gift card and I sorta went on a shopping spree. I bought a quart of sweet almond oil. I always buy large containers since I use it so often, but they also sell a 4oz size if you don't think you'll be needing much. You could also use extra virgin olive oil, but I usually save that for infusions I want to use as food. For instance a rosemary olive oil infusion is really great with some grated cheese and dipping bread! The sweet almond oil is more of a body oil. After 4 weeks, strain the herbs out using a cheesecloth and funnel. Strain into a clean, dry jar or bottle. Cap tightly and store in a cabinet away from a heat & light and you're done! I sometimes knot the cheesecloth up and throw it in the bathtub with me the next time I get a warm bath. Remember the bath oil beads of the 80's? It works just like those only better for your skin! It's great after a sunburn when your skin is all dry and itchy, or for dry winter skin. Now your oil is ready to be used. You can use it to make salves, creams, scrubs, lotions....pretty much anything. You can also just apply it directly to the skin to soothe irritation. I really love Calendula oil, there are so many great products I make with it. I'll have to give you my body butter recipe some time. Stay tuned for that! Want gardening and healthy living information sent right to your email weekly? Click right here to join my list and get new posts sent directly to you the day they're published! Great post. Followed you from the Homestead Barn Hop link-up. Love for you to come by this week’s Wildcrafting Wednesday and share. Thanks for inviting me! I linked up yesterday! I'm just starting to make our own lotions and salves and so I really appreciate this post. What kind of oil do you use? I might have missed it but I read it a couple of times. Thanks for sharing with us at Simple Lives Thursday; hope to see you again this week. I used sweet almond oil for this one. You could use olive oil, but it feels a little heavier to me. You'll really enjoy making your own products! It's so nice knowing exactly what goes into what we put on our bodies. It's much cheaper too. Have fun! Really great info! Thanks for sharing with SYC. I'm sure it's not intentional, but I'm not seeing a link back to the party. I am so sorry! I don't know how that slipped by me. I fixed it! Great post! I like the idea of recycling the calendula discards into the bath tub after. 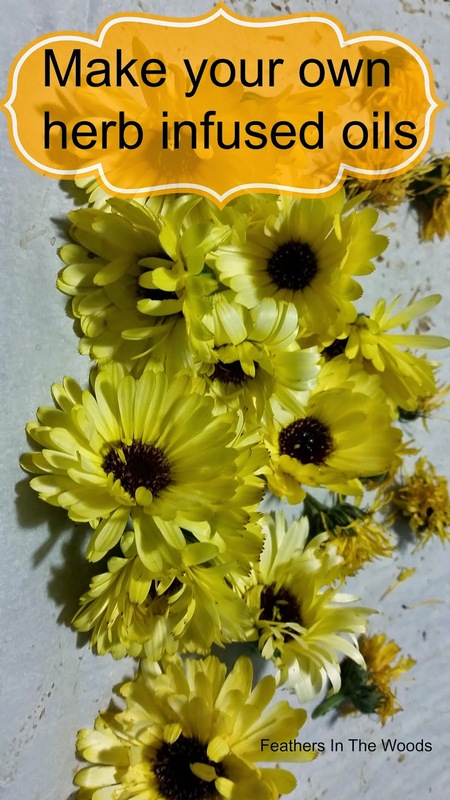 Sounds lovely ;) Thank you for sharing your calendula links on our link up this month. I will be pinning them both! We also have a Monday link up for homemaking, homeschooling and homesteading posts if you are interested. Have a wonderful week! 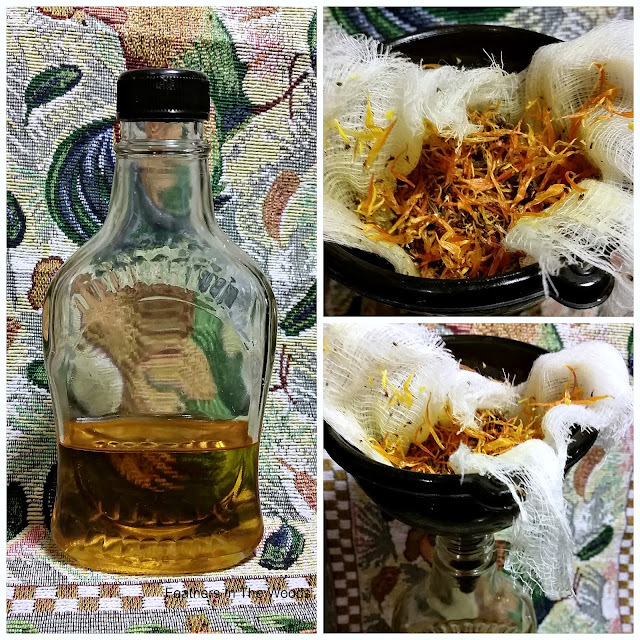 This is a very informative post on making herbal infused oil. Thank you for sharing with the Clever Chicks Blog Hop! I hope you’ll join us again next week! Thanks for adding this to From The Farm...it is one of this week's featured posts! Hope to see you again this week! Who can resist these healthy, natural infusions! I can't wait to make this at home since I make my own personal care products. Thank you so much for sharing How to make herbal infused oil with us at the Healthy Happy Green and Natural Party Blog Hop. I'm pinning and sharing.